The iPhone Professor couldn’t agree more!!! Very interesting article and we have a Macbook Air Early 2013 for sale! Did you drop your phone in a puddle or in the snow while on the mountain? Maybe you dropped it in a toilet or it went through the wash cycle! Or did you fall into the Deschutes? (Yes, that happens). We are here to help! Sometimes your device survives the dunk! We have a few tips to help your device bounce back! 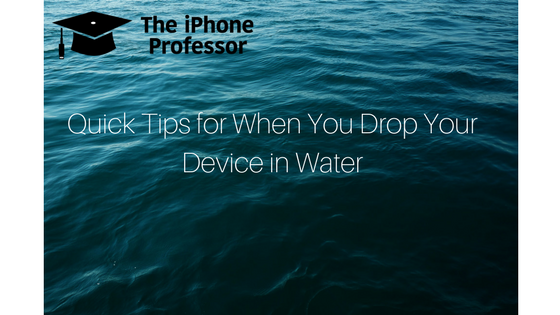 Here are 7 suggested tips if you suspect your device has come into contact with water. We are assuming you quickly got the device out of the water and immediately dried off all surface areas of the phone. Take a Q-Tip and absorb any moisture from the audio jack, speakers, and other small input/output areas. Do not turn on device. If device is powered on, power it down immediately. Bring into iPhone Professor A.S.A.P. Do not plug in device, not even for a little peak to see if it will turn on. This could solidify the death of your device. Please do not plug it in. Do not use heat. You can cause further damage by using a hairdryer. Bring your device to a professional who can open your device, dry it out, and take a look for any damaged parts. There are water damage indicators in the device. Any technician who opens up your phone will be able to see without a doubt that water has or has not gotten inside your device. If you have any other questions. We are here to help! Please backup your valuable data! 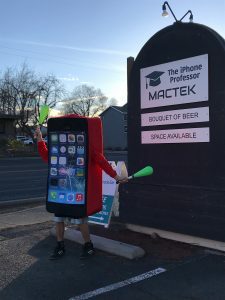 You’re invited to join us on Friday February 2nd from 3:00-4:00pm to learn how to juggle with professor iPhone. UPDATE: If you missed Professor and his juggling advice, don’t be discouraged. We are going to have another training date set in the near future. Professor iPhone cannot get enough juggling done in one day!!! Stay tuned! Looking for a reasonably-priced case for your iPhone to help prevent a costly screen replacement? We have lots of fun colors to pick from starting at $15. We recently scored some Otter Box iPhone cases and are passing the savings on to you — save 25% or more off retail prices. We have cords, plugs, connectors, back-up devices/time machines, iPad cases and more — all, again, at reasonable prices. We have a lot of suppliers who give us great prices and we like passing the savings on to you. Come into our office, 9-5 Monday through Friday, to check out our accessories. We’re located on 3rd and Greenwood (just east of the Arco gas station) in the Spectrum Building. 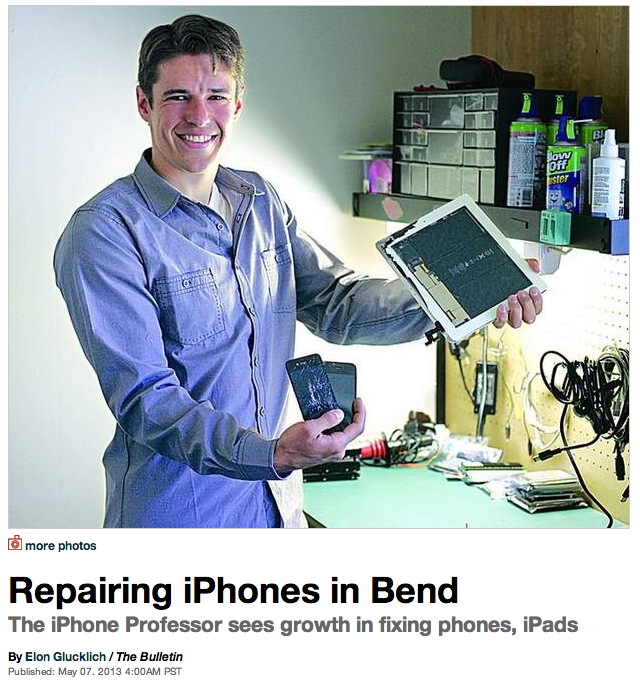 The iPhone Professor was featured in the Bend Bulletin on the front page of the Business section today. You can view the article on the Bend Bulletin website here (subscription to Bend Bulletin required), or since most people don’t have access to the Bend Bulletin website, I’ve copied the text below so you can read it here. Matt Farrell lives in Bend, but he traveled more than 7,000 miles to find his business calling. A website designer and marketing consultant, Farrell launched his own iPhone and iPad repair business in Bend last year after spending time in Australia, with a friend who repaired iPhones for Apple. Apple offers its own replacement service for broken iPhones, and can repair them if they’re under warranty. But it can take days, even weeks to send a new phone, and costs more than $200 if the warranty has expired, according to Apple’s website. Farrell said he can often fix someone’s cracked, water-damaged or otherwise dinged-up phone for half of Apple’s price, without voiding the warranty. After learning how to repair iPhones during his Australia trip in late 2011, he started his own business, The iPhone Professor, in May 2012. Smartphone repairs are a growing business. Apple sold 125 million iPhones in 2012; a quick Google search showed nearly a half-dozen people in Bend who offer iPhone repair service. Farrell knew going in he’d need to stand out to be successful. So he used his Web design expertise to create a website for The iPhone Professor, with enough information about himself and his services to let customers know he was legitimate. An initial investment in tools and spare iPhone parts got him off the ground. Farrell said he recouped that investment in his first month of business. He joined with a friend who runs a Macintosh repair business and leased office space on Northeast Greenwood Avenue in September. Central Oregon residents can bring their broken iPhones or iPads to Farrell’s business, where he can troubleshoot problems like cracked LCD screens, damage to the charge port and power buttons, or water damage. Prices range from $99 for iPhone repairs to $175 for iPads. Q: How are you trying to stand out from other iPhone repair businesses? A: I took the position (that) this wasn’t going to be a side business. I was going to do it as a serious business. That meant coming up with a nice, professional website, offering a warranty, setting up my own business phone line and hiring an administrative assistant to answer the phones. I always want to be three steps ahead. Q: What plans do you have for the company moving forward? A: We’re looking at partnering with other businesses, maybe a computer repair shop that doesn’t do iPhone repairs. That way, if they couldn’t help a customer they could send someone our way. If I’ve helped you with your iPhone or iPad and you want to leave me feedback or a testimonial, then it would be awesome if you would leave it on either my Google Maps listing, or on my Yelp profile. I’d very much appreciate it, and its the best thanks you could give me. If you don’t have a Google account or a Yelp account, and you don’t want to sign up for either of those free accounts, then you can just leave me a comment here on this post. Thanks so much, I really appreciate it!